One seized on greedily this morning by Alban Magennis of the SDLP is the comparison between the dissident republicans, who it’s presumed planted the bomb, and the IRA campaign of the 1970s and 1980s. Alban, with an eye on the Westminister election, declared both campaigns - the IRA and the dissident republicans - equally futile. He may be right. Maybe if there’d been no violent campaign against the British army and the RUC, we’d have the same power-sharing Executive that now operates from Stormont. But it’s hard to rid oneself of the suspicion that the IRA’s threat of violence and actual violence had considerable bearing on the startling differences in the old pre-Troubles Stormont set-up and what we now have. The second issue is, what sense does the dissidents’ campaign of violence make, if any? All political parties, including Sinn Fein, would answer ‘None’. If the heavily-armed IRA wasn’t able to dislodge the British, what hope the puny Real IRA or the Continuity IRA? It’s a good point but it depends on things not changing, which of course they do, all the time. At present the Real IRA can make little military impact on the British army or the PSNI or the other elements of the crown here, as they would see it. But that was the case with the IRA in the early days of the Troubles. Then, largely owing to British insensitivity, stupidity and cruelty, nationalist public opinion or a significant section of it swung in behind republicanism. 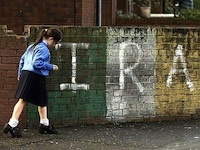 Don’t be too sure that, over time, the Real IRA won’t win similar backing, especially if, as so often in the past, the British have failed to learn lessons from history. The third point, and one I’m sure the dissidents are very clear about, is the tradition of armed resistance. The Real IRA and the Continuity IRA are incapable of dislodging or even threatening the British army, so in that sense Martin McGuinness is right to say they are militarily useless.